San Jose Jazz is committed to supporting and celebrating jazz as a dynamic, evolving art form. 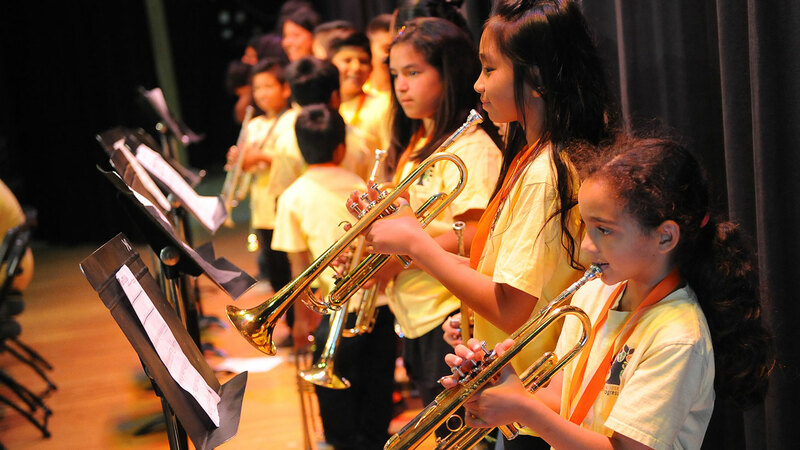 We impact the growth and development of more than a thousand students per year through programs like Progressions, Summer Jazz Camp and in-school workshops throughout the year. We couldn’t accomplish any of this without your support. In recognition of this, we’ve just re-christened our former Membership program as our Jazz Supporters program to underscore the importance of your gifts to our work. Supporter levels and benefits have been structured to highlight the good work that your gift will do in the community, provide exclusive benefits and to maximize the tax-deductibility of each level. Being a supporter gives you special access to thrilling live music all year long and also supports the amazing breadth of our music education programs. Join fellow music lovers and discover for yourself what it means to be a San Jose Jazz Supporter! Help us refurbish a donated instrument for a new child to participate in SJZ’s Progressions, a research-based youth development program that provides rigorous music education to nearly 1,000 low-income, at-risk students in the Franklin-McKinley School District. Your support helps pay for all classroom materials for one year for a Progression teacher. Your support helps purchase a musical instrument for use by a student in SJZ’s Progression program where more than 80% of kids are determined by their school site to be free or reduced lunch eligible. No ticketing fees on any concert throughout the year! Your support provides a partial scholarship for a low-income student to attend SJZ’s highly acclaimed two-week Summer Jazz Camp, a learning lab for middle and high school students that learn from and play with some of the best teaching artists from the Bay Area and beyond! Help support a young, motivated musician eager to learn. New for 2019! Validated parking for each day you attend Summer Fest! Your support changes the life of a young person by covering the costs of providing Progression to a student for a full school year. SJZ appreciates your passion and love of jazz music and support of our year-round music education programs for the San Jose community. To thank you for your support, SJZ will tailor your Summer Fest experience to your personal interests. Concierge Services tailored to your personal needs and interest in jazz during Summer Fest weekend. These may include but are not limited to, hotel room and restaurant reservations, special reserved seating at Fest sets, transportation between stages, interaction with top Fest artists and more. If you are passionate about San Jose Jazz’s mission and would prefer to fully deduct your gift, choose one of these Supporter levels with benefits directed to your interests. Your support advances SJZ education programs serving more than 2,000 local students each year. Thank you for your generosity! Your generous support enables SJZ to bring exceptional musicians to our San Jose community to inspire students and audiences of all ages. A limited number of Underwriter opportunities are available, so join early! Let us know if you prefer to remain anonymous.